(DETROIT – May 29, 2018) – 313 Presents today announced an exciting lineup to headline its 2018-19 theatre season. Through a growing partnership with MagicSpace Entertainment, the season will open with a two-week national tour kick-off of Jim Steinman’s Bat Out of Hell and be highlighted by the Tony® Award-winning production of Rodgers + Hammerstein’s CINDERELLA and multiple holiday classics which have become an annual tradition for families at the historic venue in The District Detroit. 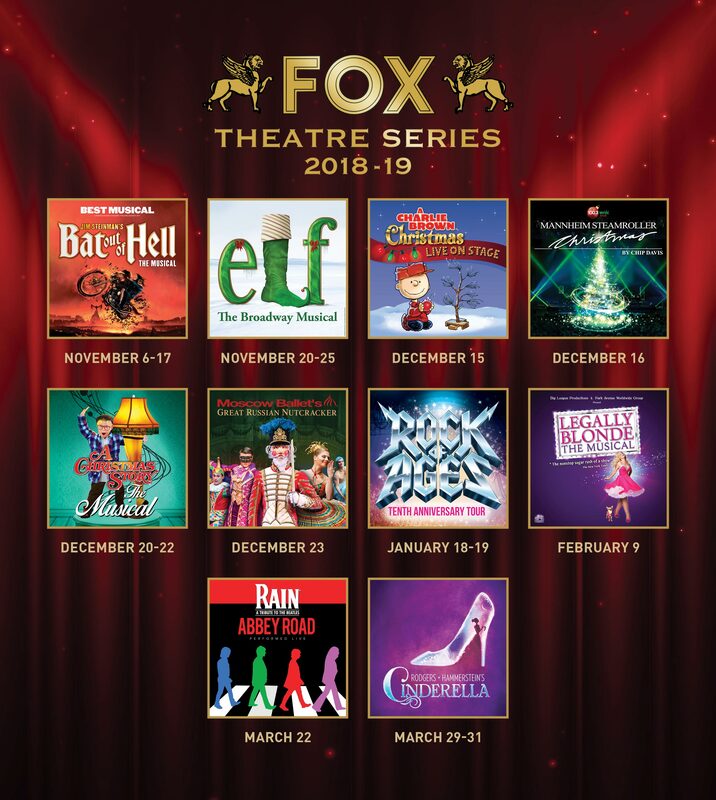 This season’s announcement follows just weeks after the Fox Theatre wrapped its strongest series to-date, closing with a 75 percent increase in total attendance during the 2017-18 season and counting 16 more performance offerings than the previous year. Series packages and group sales go on sale Monday, June 4 at 10 a.m. Patrons will receive up to 20 percent off when they purchase three or more shows. These packages offer great flexibility as patrons choose the shows they want to see on the dates and times that fit their schedules best. In addition, patrons get priority seating and many exclusive benefits. Series packages can only be purchased by calling the Olympia Entertainment Group Sales Department at (313) 471-3099. Offer is valid on select price levels and performances, and is not valid on previously purchased tickets. For more information, visit 313Presents.com. Individual tickets will go on sale at a later date. *Individual tickets are currently on sale now. The romance of rock ‘n’ roll comes alive on stage in Jim Steinman’s Bat Out of Hell (Tues., November 6 – Sat., November 17) as Strat, the forever young leader of rebellious gang ‘The Lost’, falls in love with Raven, the beautiful daughter of the tyrannical ruler of post-apocalyptic Obsidian. Bringing to life the legendary hits of Jim Steinman and Meat Loaf, this ‘outrageous, nostalgic wild child of a rock ‘n’ roll musical’ (The Times) is a fun, vibrant, boundary-pushing take on the traditional love story that can be enjoyed by all. ELF The Musical (Tues., November 20 - Sun., November 25) is the hilarious tale of Buddy, a young orphan child who mistakenly crawls into Santa’s bag of gifts and is transported back to the North Pole. Unaware that he is actually human, Buddy’s enormous size and poor toy-making abilities cause him to face the truth. With Santa’s permission, Buddy embarks on a journey to New York City to find his birth father, discover his true identity, and help New York remember the true meaning of Christmas. This modern-day Christmas classic is sure to make everyone embrace their inner ELF. Your favorite Peanuts characters come to life in A Charlie Brown Christmas Live On Stage (Sat., December 15), an all-new touring stage adaptation of Charles M. Schulz’s classic Emmy® and Peabody Award-winning animated television special all set to Vince Guaraldi's unforgettable music. Join the gang as they put on their own Christmas play and discover the true meaning of the season. A Charlie Brown Christmas Live On Stage is a present the whole family can enjoy. Mannheim Steamroller Christmas By Chip Davis (Sun., December 16) features Mannheim Steamroller classics, along with dazzling multimedia effects in an intimate setting. In addition to being a holiday tradition for many families, the Mannheim Steamroller Christmas Tour regularly attracts repeat attendance from multi-generational guests and is one of the longest running tours in the music industry. Grammy® Award winner Chip Davis will direct and co-produce tour performances with MagicSpace Entertainment. A Christmas Story, The Musical (Thurs., December 20 - Sat., December 22) brings the classic 1983 movie to hilarious life on stage! Set in 1940s Indiana, a young and bespectacled Ralphie Parker schemes his way toward the holiday gift of his dreams, an official Red Ryder® Carbine-Action 200-Shot Range Model Air Rifle. An infamous leg lamp, outrageous pink bunny pajamas, a maniacal department store Santa, and a triple-dog-dare to lick a freezing flagpole are just a few of the distractions that stand between Ralphie and his Christmas wish. Moscow Ballet’s Great Russian Nutcracker (Sun., December 23) returns to the Fox Theatre for three performances. Presenting world class Russian artists, hand-painted sets, Russian Snow Maidens, and a two-dancer Dove of Peace with a 20-foot wingspan – the Great Russian Nutcracker brings the Christmas spirit to life for all ages. Nominated for five Tony Awards®, including Best Musical, ROCK OF AGES (Fri., January 18 - Sat., January 19) captures the iconic era that was the big bad 1980s Hollywood. Featuring the music of hit bands such as Styx, Poison, Twisted Sister and Whitesnake among many others, this Tenth Anniversary production features a dynamic new cast revisiting the larger than life characters and exhilarating story that turned Rock of Ages into a global phenomenon. Fabulously fun and international award-winning Legally Blonde - The Musical (Sat., February 9) is the ultimate Broadway tribute to Girl Power. The story follows the transformation of Elle Woods as she tackles stereotypes, sexism, snobbery and scandal in pursuit of her dreams, and proves that you can be legally blonde and STILL the smartest person in the room. This contemporary, sassy musical moves at a breakneck pace driven by memorable songs and explosive dances. Legally Blonde - The Musical warms the heart by proving that self-discovery can be way too much fun and hilarious to boot. Direct from Broadway! RAIN: A Tribute to the Beatles (Fri., March 22) presents Abbey Road! In celebration of the 50th anniversary of the release of Abbey Road, RAIN will bring the greatest hits to life in addition to all your early favorites. This mind-blowing performance takes you back in time with the legendary foursome delivering a note-for-note theatrical event that is the next best thing to seeing the Beatles. Experience the worlds’ most iconic band and come celebrate the best of Abbey Road with RAIN: A Tribute to the Beatles. Rodgers + Hammerstein’s CINDERELLA (Fri., March 29 - Sun., March 31) is the Tony Award®-winning Broadway musical from the creators of The Sound of Music and South Pacific that’s delighting audiences with its contemporary take on the classic tale. This lush production features an incredible orchestra, jaw-dropping transformations and all the moments you love—the pumpkin, the glass slipper, the masked ball and more—plus some surprising new twists! Be transported back to your childhood as you rediscover some of Rodgers + Hammerstein’s most beloved songs, including “In My Own Little Corner,” “Impossible/It’s Possible” and “Ten Minutes Ago,” in this hilarious and romantic Broadway experience for anyone who’s ever had a wish, a dream... or a really great pair of shoes.